Go back in time with this complete collection of typography from the popular sci-fi show. Fans of Doctor Who will be well aware that it's not long until the sci-fi show returns to our screens. Although we'll hazard a guess that not many know about the different fonts used throughout the programme's 54 year history. Doctor Who devotees are a dedicated bunch when it comes to trivia, and it was only a matter of time until one stepped up and catalogued the diverse typefaces used in the show's opening and closing credits. The fan in question is Clayton Hickman, former editor of Doctor Who magazine, designer of Doctor Who DVD cover art, and master of obscure Doctor Who facts. Tracking the fonts all the way back to 1963, Hickman's research has turned up the precise typefaces used in each iteration of Doctor Who design. 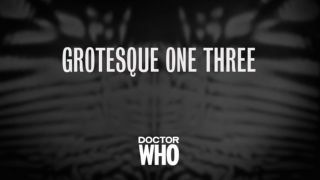 Watch serifed fonts gradually change to gloriously 80s neon typefaces in the GIF below – just keep in mind that these are the fonts used for episode titles and cast credits; the Doctor Who logos themselves (for the most part) are specially designed. This is the perfect resource for fans who want to download fonts and make their own screen-accurate title sequences (there's tons of them floating about on YouTube, believe us), but there's still even more to enjoy. We love the amount of dedication and hard work that has gone into these GIFs, but we can't help but think that Hickman might have to update this project soon. After all, with a new Doctor and a new show runner taking over next year, it's likely that there will be a whole new look for the show.